KIEV, Ukraine -- The European Union urged Ukraine President Viktor Yanukovych to take steps to free jailed political rival Yulia Tymoshenko if he wants to seal a free-trade and political deal with the EU, setting a deadline of Nov. 18 for "a definitive move." Mr. Yanukovych has shown little sign of giving in to pressure to free Ms. Tymoshenko, a former prime minister, even as European leaders have warned that her imprisonment jeopardizes the proposed agreement, which he says he wants to sign. Stefan Fuele, EU Commissioner for Enlargement and Neighborhood Policy, said it was time for Mr. Yanukovych to act. "There is a need for a definitive move with respect to the case of Yulia Tymoshenko," he said, speaking in Kiev on Friday. He said the key date was Nov. 18, when EU foreign ministers will meet for the last time before a summit in Lithuania on Nov. 28 where the deal could be signed. The agreement would anchor the former Soviet republic in the West, despite pressure from Russia for Ukraine instead to join an economic bloc it is forming with other ex-Soviet countries. Mr. Yanukovych said Friday that he wanted to find a solution and sign the deal. But he didn't say whether he'd release Ms. Tymoshenko, or offer details on how he intends to solve the issue. "We're conducting complex work, looking for ways now, and I hope that in the nearest time we will finally define how exactly this issue will be solved," he said after meeting with Mr. Fuele. German Foreign Minister Guido Westerwelle, also in Kiev on Friday, repeated an offer to accept Ms. Tymoshenko in Berlin for treatment on a back complaint, a solution long proposed by diplomats. 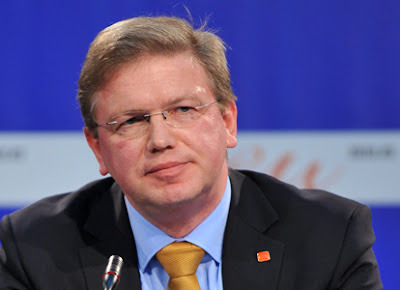 Mr. Westerwelle hit out at pressure from Russia on Ukraine to abandon the agreement. He said threats — which have ranged from tighter customs controls to a new visa regime — are adding importance to the deal. "Nobody has the right to limit the rights of every nation for self-determination. This is why an association between Ukraine and the European Union is important, and its importance does not diminish under pressure, but, on the contrary, increases," Mr. Westerwelle said.